In an incident that could make a great case-study for any law school syllabus, Pakistan forfeited a Test match against England after it was accused of ball-tampering. Are the Pakistanis a rogue team in world cricket? Or are they being unfairly treated for their past misdeeds? Blame it on an evil eye, the proverbial buree-nazar. How else can one explain that one of the most harmoniously conducted cricket series between Pakistan and England in recent memory – no controversial decisions, no temper tantrums, no hint of acrimony between teams – was marred by forfeiture! The two countries, history shows, have never been the best of opponents. And their matches have hardly been the most sporting or amicable of contests. Until the International Cricket Council adopted the neutral-umpire policy, the umpiring by Pakistan’s home umpires was a major bone of contention. In the past, a frustrated touring English team is known to have got a particularly biased Pakistani umpire tight and sozzled, and then dunked him in their hotel swimming-pool at the end of the Test series. The more recent change to a more civil – even cordial? – exchange between the Pakistani and the English cricketers on and off the field stemmed from three developments. First, the appointment of an Englishman Bob Woolmer as Pakistan’s cricket coach, who could help the Pakistanis tide over their cultural angularities in the propah-old-chap English setting. Second, the selection of the relatively laid-back Inzamam-ul-Haq (compared to a firebrand trouble-maker like, say, Javed Miandad) as Pakistan’s cricket captain. Third, the growing number of Pakistani cricketers playing professional county cricket in England when not doing duty for their country. And then this. On the fourth day of the fourth and last Test match at the Kennington Oval in London, television viewers across the globe were witness to some of the strangest happenings ever on or off a cricket field between cricketers and officialdom. The result was a first in Test cricket history: a team forfeiting a match over a no-show protest triggered by allegations of cheating – in this case, ball-tampering. The incident, unprecedented in 129 years of international cricket during which 1,814 Tests have been played, has cast a shadow not only on the rest of the tour, which includes five one-day internationals between England and Pakistan. It also threatens to have serious implications on how the game is administered and umpired. Before all else, let’s enumerate the facts of the case. Pakistan was in a strong position to win the Test when the first sign of trouble came. Australian umpire Darrell Hair picked up the ball a half-hour before the tea intermission. He brought its roughed-up condition to the attention of his fellow-umpire West Indian Billy Doctrove and of the Pakistani skipper Inzamam-ul-Haq. Hair then proceeded to penalize Pakistan five runs for ball-tampering and allowed the English batsmen, as per the rules, to select an alternative ball. Inzy was seen to protest verbally on-field against Hair’s decision, but Hair was unmoved and play carried on till tea. After the tea-break, the umpires and the English batsmen went onto the field, but the Pakistani team stayed put in their dressing-room. The delay was apparently a form of protest. Having waited for the fielding team in vain for about 20 minutes, the umpires knocked off the bails (signifying end of play) and returned to the pavilion with the batsmen. A few minutes later, Inzy led his team out to the ground and they too returned to the pavilion when they saw only groundsmen there. Okay, so we all know England won. But who was the loser? Was it Pakistan? Or, was it the game of cricket we love so much. If the events of that fateful day are analyzed from a cold legal perspective, they could be clubbed into two distinct sets of issues. The first relates to the alleged offence of ball-tampering, the second to the business of forfeiting the match. In the first instance, the only clear inference one can arrive at is that the crucial facts are still unclear. Let me clarify. That the ball was roughed-up is not in any way a disputed or disputable fact. It was, after all, nearly 55 overs old and was repeatedly tonked into the stands during those overs by at least one mercilessly hard-hitting English batsman Kevin Pietersen. That the umpire in question was well within his rights to stop play, inspect the ball and rule on its condition is again, in no way, challenged. The crucial evidence here is the sighting of the ball being scuffed by a Pakistani player. And that evidence, from all accounts, is not yet available. Neither Hair nor any ICC official has come up with the offender’s name, and none of the 26 live-television cameras showed any untoward activity with the ball during the entire duration of the England innings. This fact too was admitted by the television commentators. But that raises the knotty question: Do we always need to see a criminal actually commit the crime in order to hold him guilty and punish him, or is the evidence – albeit circumstantial – enough of a smoking gun? Some would argue that the former requisite would make it almost impossible to prosecute any killer who has ensured there were no eye-witnesses to the killing. This line of reasoning would be prone to view the corpse and any other relevant “fact” – such as the presence of none else but the killer at the murder site or even the motive of the accused – as sufficient reason to hang the man. Others would be more circumspect, and demand more weighty and compelling evidence before reaching a verdict. 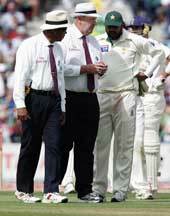 In a modern cricketing venue (like a stadium) where every on-field act attracts the scrutiny not only of thousands of spectators, but also dozens of professional reporters, commentators and hi-tech cameras, is it too much to expect an authority accusing a team of ball-tampering to produce evidence or even the name of the so-called offender? As for forfeiture, the Pakistanis are on thinner ice. Those who merely watched the live-television coverage without reading the various news reports that followed the incident would wonder – quite legitimately – if Umpire Hair had not jumped the gun. TV viewers saw no shot of either umpire visiting the Pakistani dressing-room to ascertain whether or not the team was planning to take the field. But subsequent news reports confirmed what they didn’t see. The umpires, we now learn, did approach Inzy who showed no inclination to continue playing. What is the rest of the world to make of the entire Oval incident? THE PAKISTANI CRICKETERS, Even if one agrees with Shahryar Khan that Hair has been particularly unsympathetic toward Pakistan, their refusal to play was nothing short of biting the bait. The saner option was to continue playing the match and then lodge a strong written protest against Hair for making unfounded accusations. They would then have earned a huge dollop of sympathy from cricket-lovers across the world who are awed by their mercurial talent. But these same cricket-lovers also know that the needle of suspicion is never far away from the Pakistanis when it comes to ball-tampering. The first accusations came in 1993 from (who else?) the Englishmen who alleged – without proof but with a lot of silent nods from non-Pakistani cricketers – that Wasim Akram and Waqar Younis scuffed the ball and lifted its seam to make it reverse swing. The latter (he is the present bowling coach, no less, of the Pakistan team!) was officially suspended in 2000 for the same offence in an ODI against South Africa, while Shoaib Akhtar was banned for two games in Sri Lanka in 2002-2003 for his illegal shenanigans with the cricket ball. To be sure, there have been cricketers from other nations at fault too. English fast bowler John Lever stealthily applied Vaseline on the ball to wreck an Indian innings, and the then Indian captain Bishen Singh Bedi had to forfeit his English county contract for blowing the whistle on him. TV cameras caught English captain Michael Atherton rubbing sawdust on the ball in a 1994 Test against South Africa. And our own Sachin Tendulkar, otherwise squeaky clean on cricketing matters, was suspended for ball-tampering in 2001. But while these are seen as one-off exceptions, the perception – perhaps unfounded – that the Pakistanis as a rule are cheats has taken firm root. And there are whispers that they’re wily enough to work on the ball between overs when the television cameras are switched off for commercial breaks. True, the on-field umpires aren’t blind, but you can never under-estimate the “talented” Pakistanis, their detractors assert. Another case of the crooks being smarter than the cops? DARRELL HAIR Talking of reputations and perceptions, the word “cop” has special relevance for this Aussie umpire. Not that he ever worked in the police force, but his policeman-like petulant demeanour and his reported zeal to come down hard and fast on rule-violations by South Asians are as quirky as they are legendary. He no-balled Muttiah Murlidharan in Australia for chucking in 1995-1996, didn’t officiate for nearly a decade thereafter in any match involving Sri Lanka and when he finally did, apparently thought the action was fine, even though he described it as “diabolical” in his autobiography. Apart from this inconsistency, Hair is generally regarded as a “correct” umpire. His problem though is that he might in fact be “too correct.” No denying that Test cricket needs to be played in all seriousness, but an over-exacting or over-suspicious umpire can kill the spirit of the game by an over-adherence to the letter of the law. A diametric opposite of clowning umpires like Billy Bowden and Dicky Bird, Hair needs to take a more moderate stance without letting up on the rules, the kind of balanced attitude that have made David Shepherd and Simon Taufel the world’s best. As I write this, my cell-phone is abuzz with calls from reporter-friends. Did England’s coach Duncan Fletcher incite the action against the alleged ball-tampering by sidling up to the authorities and letting on some damning clues? Is Inzy being targeted by ICC for bringing the game into disrepute? Is Hair being targeted by PCB which wants him to officiate in no future ties involving Pakistan? Is there a “deal” in the offing, with ICC easing Hair out of the Elite Umpire Panel and PCB replacing Inzy with Younis Khan as captain? It’s indeed sad that so much is being written and spoken about matters that don’t involve actual performances on the cricket field. I’d rather my cell-phone buzzed, for a change, with a discussion of an exquisite square-cut or a perfect yorker.